My tent is dirty. How do I clean it? After a trip, it is a good idea to set your tent up and then clean it with a sponge and lukewarm water. We do not recommend using any cleaning products. It is also very important to take a small brush and really brush the zippers, so that there is no sand or grit left in the teeth. Sand in the zippers can wear down the sliders and prevent them from working properly again. Check and make sure that your poles and pegs are clean and don’t have any damage. If the tent is very dirty and dusty, we usually put it in a big tub of water and let it soak there for a while – an hour or so – periodically moving it around in the tub. This usually helps to take care of more dust and dirt. No matter how you clean it, make sure the tent is completely dry before packing it away. Ideally hang it up inside with the poles in it, but if there is no space for that, just make sure that it hangs long enough so that it Is completely dry between the layers. 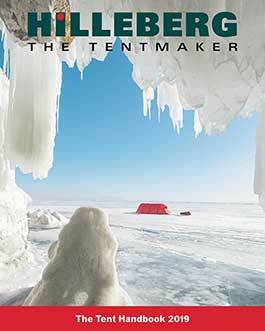 How do I pitch a Hilleberg tunnel tent? When using a footprint, which side goes up? With the tent pitched can the inner tent be partially unhooked? My tunnel tent is noisy, in strong winds, what can I do? How tight should the door band be on my tent? How tight should the ground straps be on my tunnel tent? My tent has seen a lot of heavy use, how can I re-treat the fabrics? How do I roll my outer tent door? How do I pitch the inner tent separately? How do I use a line runner? My pole broke, what do I do? My zipper doesn’t work, how do I fix it? How do I attach a line runner? Why do the footprints on the Anjan, Rogen, and Niak tents not cover the vestibule? My tent is paler after a lot of time in the sun, what happened?